Almost all fishkeepers have heard of the Pleco but they are also known for growing rather large. Steven Caller, Editor of Aquarist Magazine takes a look at whether the Pleco is suitable for your tank. The Pleco, more technically known as the hypostomus plecostomus, is a member of the loricariidae family of catfish. These catfish are found in tropical waters in South and Central America and are commonly knowns as as suckermouth catfish or armoured catfish owing to their appearance and behavioural habits. Many Loricariids are given an L-number since they are awaiting taxonomic description. The Pleco is one of the most popular aquarium catfish and is often purchased as an algae eater, justifiably since they are very effective tank cleaners. They eat leftover food, algae, plant and animal matter. Many Pleco owners like to feed them sinking catfish pellets and algae wafers. They occasionally feast on shrimp too as well as any soft vegetables you add to their tank. All in all the Common Pleco is a great tank cleaner and a hardy fish too. Home is where the heart is for this fish which likes to find itself a hidey-hole to spend most of its time in. You may have noticed in aquarium shop tanks they are normally found suckered to the glass in the corner of the tank. They are very sensitive to danger and are quick to swash their tails around when they feel threatened. It is advisable to avoid netting Plecos if at all possible to avoid tangling their tail spines in the net. Generally speaking it is actually easier to grab them in your hand should it become necessary to remove them from their tank. As far as water parameters are concerned, the Pleco is fairly tolerant providing the water is clean and within accepted tropical norms. A temperature of 25°C and a PH around 7 will be perfect. Plecos are often sold at a young age, usually no more than 2 or 3 inches long. This often gives people the false impression that they are buying a relatively small fish however this couldn’t be further from the truth. 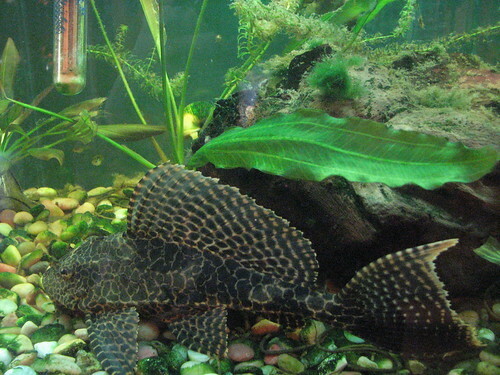 Plecos can grow very quickly and reach an adult length of 24 inches. This is far bigger than most home aquariums can comfortably accommodate. In addition, most people insist on feeding their Plecos vegetable matter in addition to letting them snack on algae all day. The consequence of this is that the poor fellow needs to eat an enormous amount per day, creating a large volume of waste in the process. This can have an overall negative effect on the water quality in your aquarium, with potentially awful consequences for your other fish. Keeping them in a tank that’s too small may stunt their growth as well as causing undue stress. So should you buy a pleco? The answer, despite its popularity would have to be no in most cases. They are unsuitable for planted aquariums as they uproot and destroy aquatic plants; they are unsuitable for aquaria less than 75 gallons in volume and are generally quite messy fish. In all probability there are thousands of Plecos around the world kept in tanks far too small for their requirements. However, if you have a large enough tank without eels or knifefish you may with to buy a Pleco. They are very interesting in their own right just a bit of a tank buster. Several other fish are called pleco and some are smaller, these may be worth looking at as a suitable alternative. Fish such as the Zebra Pleco are less growth-spurt-happy and more attractively coloured.